A deeply satisfying combination of meat sauce and rich yellow fresh pasta. Sounds familiar? Well, yes, because like its famous cousin ragu, lasagne is the product of the fertile minds that inhabit the kitchens of Bologna. But whereas one dish involves the meat sauce relaxing in the warm embrace of ribbons of tagliatelle, this one sees it tucked under the sheets of pasta - lasagne, from which the name derives. Baked pasta dishes are always a firm favourite as a primo or first course simply because the oven-proof dish in which they cook can be easily transported to the table along with a wide-head serving spoon in order that the diners can help themselves, saving the hard-working host a lot of time and energy. For the meat sauce, the method for making ragu should be followed (see our article on Ragu Bolgnese), namely using beef or a combination of beef and pork. For an extra layer of luxury the ragu could be supplemented by the addition of some chicken livers, chopped finely and added to the sauce in the final hour of simmering. As the ragu recipe referred to above is for six, measurements to satisfy this amount of people will be provided for the remaining elements of the dish, namely the fresh pasta and the besciamella, or flour, butter and milk sauce. 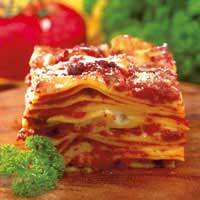 Sheets of fresh and dried lasagne are available commercially from delicatessens and supermarkets, but the dish really does benefit from the inclusion of the home-made variety. Sift the flour to remove any lumps and place on a clean work surface. ( A bowl would make an adequate substitute, although it would be a little restrictive in terms of working the dough.) Make a hole in the centre of the flour and break the eggs into it, ensuring no small pieces of shell break off. Take a teaspoon and lightly beat the eggs, amalgamating the yolk and the white, then beginning from the outside in, begin working the flour into the egg mix. When the flour and eggs have come together into a dough ball, dust a little more flour onto the work surface and knead until the surface of the ball is smooth. Wrap in clingfilm and leave in a cool corner of the kitchen for an hour. Then dust the work surface, cut the ball in half and roll out the pieces of dough into a thin sheet, cut into rectangles of about four inches by six, then cook the pasta in boiling water for about two minutes before setting aside. On a low heat, melt the butter in a thick bottomed saucepan, then stir in the flour and amalgamate into a thick golden paste. Bring the milk to the bowl and add a ladle at a time to the flour/butter mix, stirring continuously to avoid lumps forming. When the milk has become exhausted the sauce should be creamy but not too thick. If this is the case, add a little more warm milk until the correct consistency has been achieved. This can be measured by dipping the back of a wooden spoon into the pan.Then run a finger through the sauce on the spoon and if the line remains, then the sauce is thick but not too runny. Finally adjust the sauce for seasoning with some ground sea salt. Take an oven-proof dish and spoon in some of the meat sauce, coating the bottom. Then place a layer of the pasta sheets on top, followed by meat sauce and some of the besciamella. Repeat the process, finishing with a layer of pasta topped with the remaining besciamella, some freshly grated nutmeg and a generous amount of parmigiano. Bake on the middle shelf of a 200°C preheated oven for about 30-45 minutes.